Unless you lived in Fermanagh or kept a close eye of the Ireland men’s sevens set-up, the name of Robert Baloucoune is not one many Ulster fans would have been familiar with. Roll on a few months and he is a player many people are talking about - and not just in his home Province. 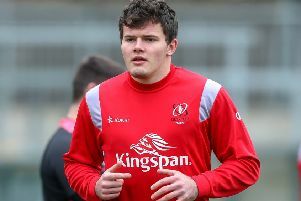 When it comes to wingers in Ulster and indeed Ireland, Jacob Stockdale has been the name in lights. The three-quarter scores tries for fun, but Baloucoune is now muscling in on the big stage - and it does not get much bigger in club land that the European Champions Cup. Having made four appearances for Ulster in the Guinness PRO14, the 21-year-old Abbey Insurance Ulster Academy player made his debut in the European Cup against Racing 92 and marked it with a try. Against Leicester Tigers on Saturday afternoon as Ulster rallied to secure a place in the last eight, Baloucoune stepped up and chased Billy Burns’ perfect chip to go in under the posts for the try which John Cooney converted to give his side a 14-13 win. If he continues in this form he will surely find a place in the matchday panel that will face Leinster in the quarter-finals at the end of March in Dublin. As for the past two weeks in an Ulster jersey, Baloucoune said: “It’s been quite the experience, hasn’t it? “I was quite surprised to be picked for the Racing game and I took it as it came. “It’s been good to get the tries to settle in, especially against Racing getting it early, it’s helping me in quickly and I’ve just been building from there. “I do feel a bit of pressure before the game but I probably don’t show it as much! And it was not just the attack which catches the eye with the Enniskillen man - his defence has equally impressed and a try saving tackle on Greg Bateman was one not be forgotten. Baloucoune praises the players around him for their help and guidance. “Louis (Ludik), and even Jacob (Stockdale) the amount of times he’s played and how he’s performing at the minute, are just constantly talking to me. Baloucoune continues to learn and he certainly did not expect to find himself where he is at present. “The Dragons game was my first game and I was shocked by that. I’m just enjoying it, I’ve been given the chance and now I have to take it. “I’d say a lot of boys feel like seniors, we’re training every day with them. “I get along with the boys, and a lot of the Academy boys are training with the seniors, so you fill in and you know everyone then. As for that try which put it beyond doubt if Ulster would progress to the last eight or not, Baloucoune said he never dreamt he would be in the position he is. “If someone said I was playing this year, I would have been surprised by that,” added Baloucoune. With the Six Nations Championship window approaching, Baloucoune knows there were be further opportunities. “I just want to be playing as much as I can. I’m trying to keep my spot on the wing. “Hopefully there’ll be a few more Academy players getting their chances because there’s a lot of talent coming through.